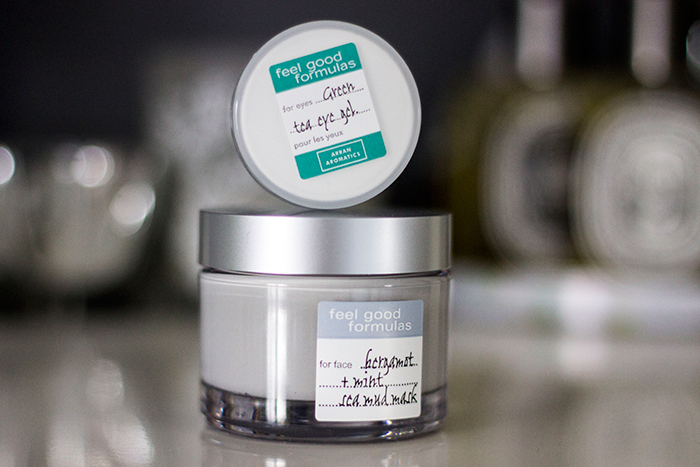 Last week we spent a little evening with Arran Aromatics in Glasgow and came home with three products to try out from their Feel Good Formulas range. We've now had a weeks trial with the products and here's how it turned out. 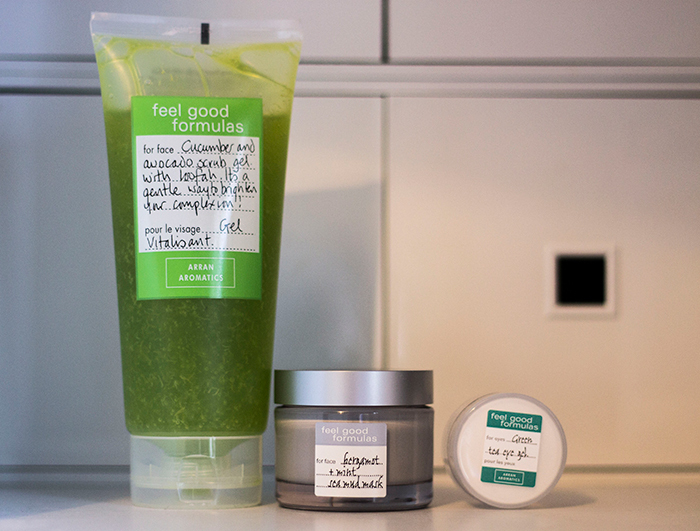 First up is the Cucumber and Avocado Facial Scrub which was a welcomed addition to my skincare regime. Recently I've been getting annoying dry patches in between my eyebrows and nose, which for an oily skinned person, is something you don't expect to deal with. Clay masks would sort out the problem but then it would return the next day. I'm usually a bit nervous about using exfoliating scrubs on my face but the particles are so tiny in this that it's quite hard to do any damage or scratch your skin too hard. I'm always a fan of cucumber scents in products but I'd say this has a little bit of a citrusy kick to it which helps you wake up in the morning. You simply take a small amount, massage it into the skin and rinse off with cool, clean water. As for the dry patches after using this, they didn't come back for a few days later so I'll definitely get a lot of use out of this product. 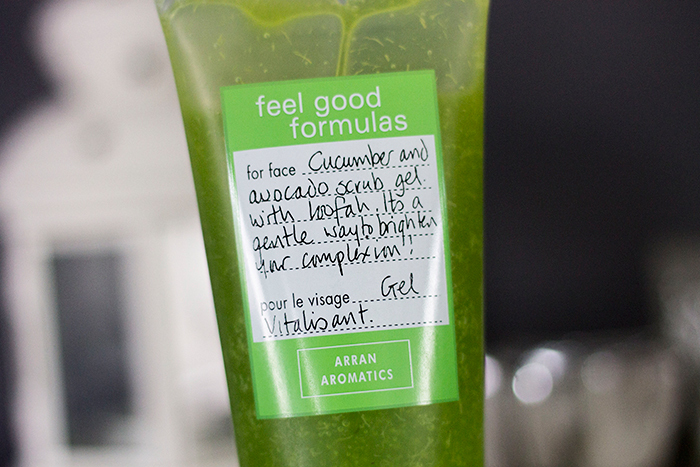 During the Arran Aromatics event, everyone swooned over the Green Tea Eye Gel so we were very excited to take it home with us. I'm always a little sceptical as to whether eye gels or creams make a huge difference in the long run but anything that cools down the area after a long day wearing mascara and eyeliner is a winner for me. It's a very lightweight gel with an almost watery consistency which you pop on underneath the eyes and it has such a lovely cooling effect. I like to pop it on at night as I feel like when I wake up, my eyes feel less puffy and more like I've had a good night sleep. I wouldn't say it's a groundbreaking product but it's definitely a lovely treat for the eyes. My skin tends to get a little red and irritated at times and thats when I know to reach for a sea mud mask. It's one of those things I know I'll get on with so I was definitely looking forward to trying out the Bergamot and Mint Sea Mud Mask. I do love the scent of bergamot and mint but if you're not a fan, they're definitely a subtle scent so it doesn't overtake the mask. Most masks I've tried have been very thick and take forever to dry but this one is the opposite. I could have applied it to one side of my face and while I'm doing the other, the other side is already dry so it's great if you hate waiting around. As I expected it helped calm the redness down and the removal process was a lot easier than I expected so if you're looking for a fuss free mud mask, look no further. the facial scrub looks awesome, you can really see the ingredients. and the eye gel looks really nice to use as well. is this a uk based brand?